The EU’s Article 13 is part of its Copyright Directive, an effort to update copyright across the EU. That makes sense — the last time this was done was over a decade ago and a lot’s changed since then. Article 13, on the other hand, doesn’t make sense at all. 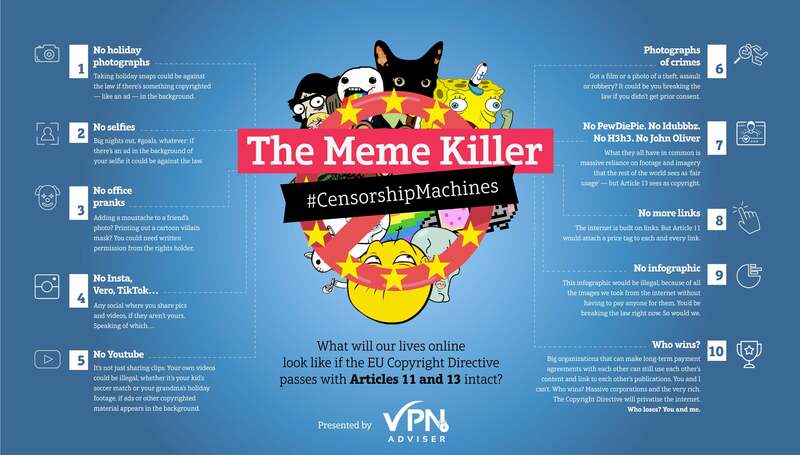 Crammed in at the last minute using parliamentary shenanigans that virtually ensured it would pass the EU parliament, Article 13 is a piece of dangerous and ill-thought-out overreach that would make it illegal to use any piece of content that’s copyrighted without the owner’s permission. If there’s something copyrighted in the background, you could be breaking the law. Again, any copyrighted image in the background would make it illegal. That could be drinks cans, shop signs or adverts behind you. No making people jump with printed-out masks, no putting moustaches on pictures of your co-workers. Networks like these depend on sharing images. I’m guessing we don’t need to draw you a picture about what Article 13 means for their future. Youtube is a fantastic place to share films you’ve made. But even if it’s just a movie of your grandkids walking for the first time, any copyrighted imagery in the background would make your movie illegal. Since the smartphone became ubiquitous, millions of crimes and alleged crimes have been filmed. The footage has helped catch and convict criminals, or show that it wasn’t them after all. But now, the rights of copyright holders are more important than safety and security. Goodbye Pewdiepie. You’re fine with that? OK, goodbye John Oliver. Goodbye Trevor Noah. Any comedy or commentary that makes use of copyrighted images, whether it’s goof-off Youtube stars or highbrow political stuff, could be off-limits under Article 13.
Who actually wins from all this? Only the big corporations that own the rights to images, sections of text, movies, characters and even computer code. Everyone else loses their ability to share and remake freely. Yes, this is a worst-case scenario. No, it probably, maybe, hopefully won’t be this bad. After all, laws this draconian are unenforceable in practical terms. Instead, what’s likely to happen is that the EU enforces them only sometimes. But living in an EU where I might be allowed to say what I like, depending on if someone somewhere feels like letting me, doesn’t sound that great to me. Please, share far and wide. Give us the credit, though? Thanks! If you don’t like the sound of this, try contacting your MEP. You can call and email them here, or tweet to them here. Alternatively get active on the internet (while you still can!) — remember, making some cultural noise makes a difference too. If you’d like to learn more about censorship issues online, there’s an open teleconference with Open Rights Group director Jim Killock coming up on Thursday the 6th of December. To attend follow the Hangouts link here.